The 12th annual Flex Conference and Exhibition, sponsored by the FlexTech Alliance, started this week in Phoenix Arizona. 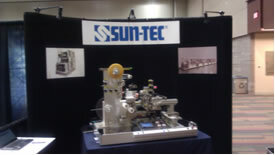 This is the first year for Sun-Tec to participate at the show as an exhibitor, but I don't think it will be the last. We featured the "Shuttle Table Type" laminator in our booth, and got a lot of attention from the conference attendees, as well as the local media. We were interviewed by the local newspaper, "The Arizona Republic", and photos along with our quotes were used in the online version(azcentral.com) of the paper. There was also a local news crew from News 12 TV that filmed our equipment demo laminating a sheet of polarizer film onto a glass substrate. They were very happy to find a local company from Scottsdale at the show. They best thing about the "2013 Flex" show is that we got to spend time with some of the customers that are using our equipment, and see the end products that they are making. We met a CEO of a company who using our machine in their production. He did a presentation at the conference that included a video of our equipment in their production line! We were very proud of that. 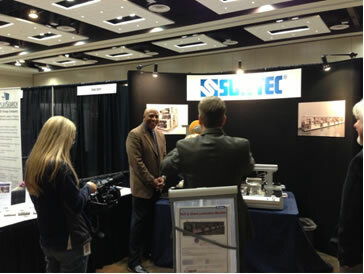 Overall, Sun-Tec got a lot of "free publicity" from the show. It was a great opportunity for us to show our equipment, and what we can do. As I said, this year may be our first year to attend, but it will not be our last.